The oldest operating theatre in Tuscaloosa. 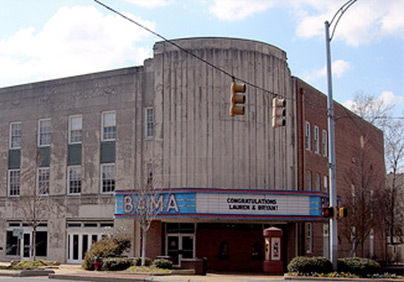 In 1938, the Bama Theatre served as the community’s grand movie house, as well as the only air-conditioned building at that time. The Theatre was one of the last movie palaces built in the South. The building was odd but an interesting mixture of Art Deco style, popular during the period and the lavish so-call “atmospheric” style of theatre architecture popular in the 1920’s. The interior is decorated in the Moorish style of Renaissance Spain. The house of the theatre is actually a reproduction of the courtyard of the Davanzati Palace of Florence, Italy. The entire orchestra and balcony sections are decorated as a Spanish courtyard, complete with balconies and ironwork. Twinkling stars and clouds on the night sky ceiling complete the open-air feel of the performance hall. Besides hosting the Kentuck Arts Festival every October, Kentuck holds art nights open to the public on the first Thursday of every month. 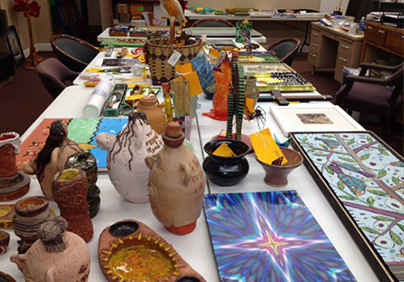 Open Tuesday to Saturday, the gallery shop features year-round rotating monthly exhibits of some of the region’s finest arts and crafts. Hours: Tues.-Fri. 10 a.m. – 5 p.m. Sat. 10 a.m. – 4:30 p.m. 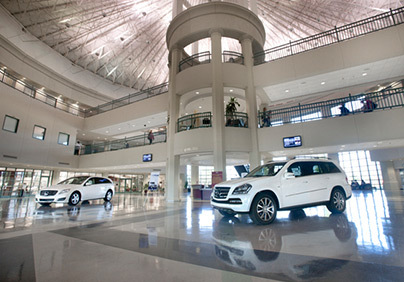 Enjoy exciting multimedia exhibits, vintage automobiles and a world-class gift shop. Open Monday-Friday. FREE admission. 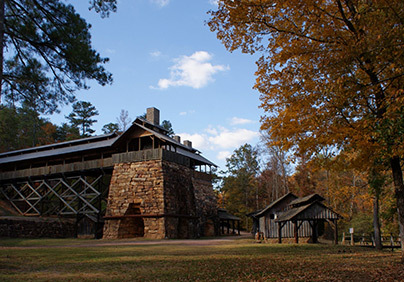 This historical state park contains a monument to the confederacy. The park offers camping, golf, hiking and swimming. Special events include a re-enactment of a Civil War battle and monthly Trade Days. This park is located west of Tuscaloosa off of I-20/59. CHOM, where children Explore, Create and Discover every time they visit. When we say “hands-on” we really mean it! 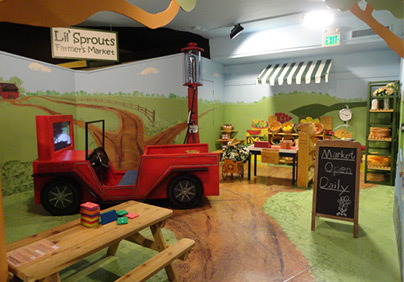 Learning through play is what our exhibits are all about, and you are encouraged to touch, feel and play in our exhibits. Three floors of fun wait for families and school groups, too. With 23 exhibits, CHOM offers newborns through age 13 a fabulous place just for them! 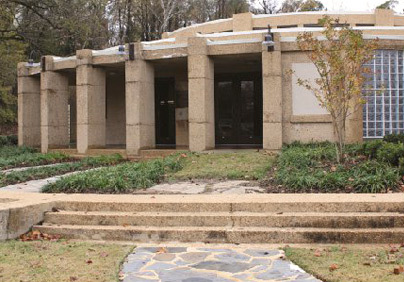 Exhibits, special events, holiday celebrations and parties are all waiting at CHOM! Our Newest Exhibits: “Kool Zone”; “ Space Station CHOM”; “The Farmers Market” and recently renovated “Beavers’ Bend” and “DCH Hospital”. 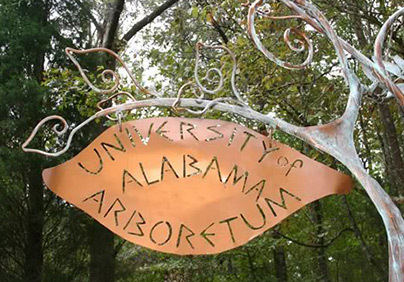 Explore meadow, bog, and woodland wildflower gardens of native Alabama plants and plant communities. Capstone Men and Women, UA’s student ambassadors, lead campus tours starting from 203 Student Service Center each weekday at 10 am & 2pm and 10 am on Sat. 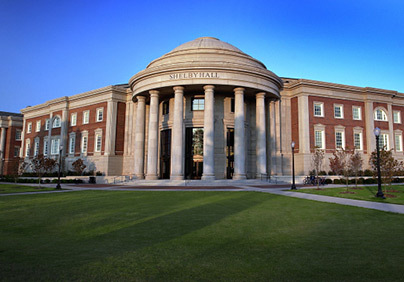 To reserve your place on a tour call (205) 348-5666 or e-mail to tour@ua.edu.